EML, which stands for ‘E-mail’, is the file extension of the Outlook Express Saved Mail Messages files. It belongs to the Microsoft range of e-mail management programs and is used for saving e-mails for storage and forwarding purposes. Since the object of an EML file is to store e-mail messages, it is a plain text file, and as a result, has a standard file structure. It consists of a short header and the main body. The header contains the e-mail addresses of the sender and the recipient, the subject, and the time and date of the message. The main message of the e-mail is in the body of the file. EML files can also contain hyperlinks and attachments. Since EML files are created to comply with the industry RFC 822 standard, they can be used with most e-mail clients, servers and applications. Besides the Microsoft Outlook Express, EML files can be opened using most e-mail clients, such as Microsoft Outlook, Microsoft Entourage, Mozilla Thunderbird, Apple Mail, and IncrediMail. Since EML files are plaintext and formatted much like MHT (MIME HTML) files, they can also be opened directly in the Internet Explorer, Mozilla Firefox and Opera, by first changing the file extension from ‘.eml’ to ‘.mht’. It is also possible to view EML files outside any email client using a free Coolutils Mail Viewer. Download your copy and select the folder with EML files. The viewer will show you the body of the email and the attachments if any. 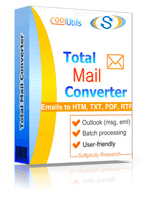 To convert EML to PDF, HTML, TXT or other formats try Total Mail Converter.